Years ago, we had a gym membership. We did actually use it – for about a year. It was great. We were getting into good shape, lifting heavy(ish) and doing well. After the first year, between a move and annual fees increasing (surprise! ), we decided to start putting together our own equipment. Of course, hindsight is 20/20 and I would set things up a little differently now, but the savings is something we still enjoy. Not only did we save money in the long run, but we saved time. Before, we’d head to the gym (10-15 minutes), change (5 minutes), workout (60-ish minutes), shower (15 minutes) and head back home or to work (10-15 minutes). All said, that was almost 2 hours of our time to work out. Now, we head to our “gym” in the basement and it saves us a bunch of time. This is great because when we originally started working out, we didn’t have kids. Add kids to the mix with work and chores and whatnot, 2 hours away to workout just wasn’t going to happen. The money savings are great, too. Besides no membership fees, we don’t feel compelled to buy fancy, or even semi-fancy, workout clothes to impress other patrons. It’s just us. An old t-shirt and shorts? Sounds good! All that being said, it is good to start creating your own home gym with a plan in mind. Before you start thinking about equipment, you may want figure out what types of exercise you actually like doing. Do you prefer weight bearing exercise, yoga, or cardio? The equipment is different for each. The best home gym equipment is going to be what you will actually use. While it’s easy to put together an effective home gym for little money, if you are only motivated to exercise by getting out of the house, a home gym may not be right for you. The good news is, even if you like to mix it up a bit, there are great options available on a budget. We originally started out by getting a set of dumbbells and other weights (barbell, etc). That was good and we don’t regret the dumbbells. What we would do differently would be to get a good power rack. On the other hand, neither of our houses has had basement ceilings high enough to manage a normal sized power rack nor one that would also allow us to do chin ups. Those aren’t cheap items, but we did know what we wanted and we still use those weights today. If you have a tighter budget, you can still put together a nice setup at home for your needs. Prices vary, but you should be able to easily get the basic equipment below for under $100 total. A yoga mat isn’t just for yoga. The mats are great for preventing you from sliding around when doing push-ups, stretches, or just adding a bit of padding to a hard floor while you do floor work. The nice thing about yoga mats is they come in a wide array of colors and patterns so you can find something that appeals to you. Weights are a great way to get in shape and very versatile. With a pair of dumbells, I can get a full body workout through exercises such as shoulder press, rows, bench press, adding weight to lunges and squats, and more! They are also something that end up at yard sales or listed on Craigslist or the like. Do note that these are the most expensive item I’ll list. So, before you buy new, check out Craigslist, Facebook Marketplace, or Freecycle for people selling used dumbbells, kettlebells, or even barbells with weight plates. The best time to find deals is probably February or March as people give up on their New Year’s resolutions. Looking at prices around here, used weights seem to sell for about $1/pound, so a 25 lb dumbbell is about $25. New weights are around $2/pound or more. A good option, especially if you are tight on space, is to get a set of adjustable dumbbells. You can even get additional plates later. Not sure about weights but know resistance training is good for you? Resistance bands are a good and frugal addition. They even are compact enough to pack in a suitcase and take with you on a trip! If you need latex-free options, those are available as well. Need an alternative to running for cardio? If you have a high ceiling or don’t mind stepping outside, a jump rope is an inexpensive piece of gear that is quite useful. It’s great for warm ups or a full-blown calorie-burning workout. Not sure how to keep jumping rope from getting boring? There are lots of different exercises you can do with one. The items above you can likely find for less than $100 total. For a little bit more, you can vary your workouts with these other options. So many of us hunch over at our desks every day. A good back workout can help alleviate some of that pain. An easy way to do that is to work on pull-ups and chin-ups with a pull-up bar. You may have seen someone lightly bouncing on a ball at their desk (or was it just the people I worked with? ), but stability balls are good for more than just a bouncy chair. They can give your core a great workout as you stabilize those muscles while doing planks, jackknife, leg curls, back extensions and more. If you like bodyweight exercises but want more of a challenge, then a suspension trainer is a great investment. Some of these you can even pack to take with you on trips. You can do a huge variety of exercises with these including core, upper and lower body. Of course, if you like options available on DVDs then be sure to check yard sales and even thrift stores, or check out videos from the library. YouTube is another great resource for workouts, whether it’s yoga, pilates, interval training (HIIT), how to lift weights and lots more. You needn’t go out and buy a whole set of dumbbells, a treadmill, and a bunch of specialty gear to workout at home. A few select multi-purpose items will serve you well. If you choose to build up your equipment later, there is time to do so within your budget. What is your favorite workout equipment? 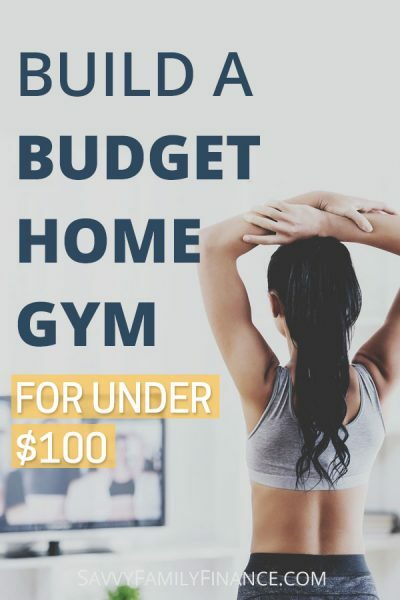 Do you workout at home?